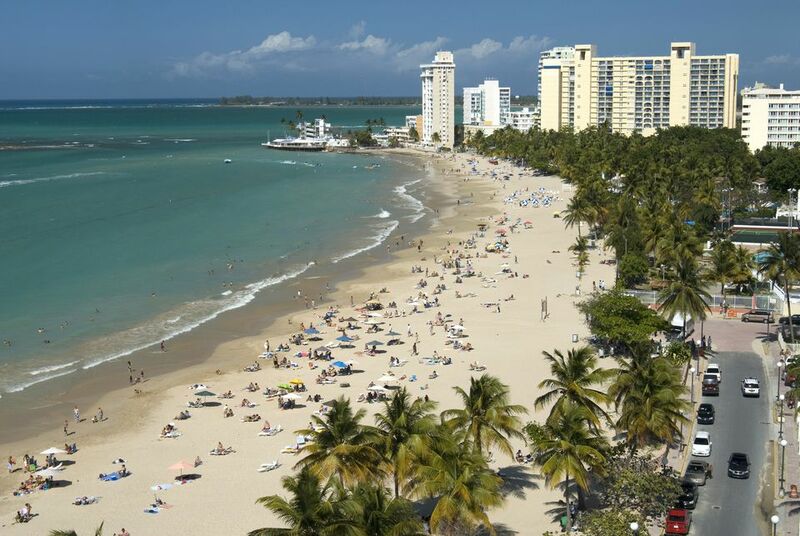 Many tourists who visit San Juan choose to stay in Isla Verde, which is technically part of Carolina, not the capital. Why make your home here instead of the capital? The main reason is the wide crescent of golden sand and azure water that makes up Isla Verde Beach. Some of the most well-known and well-regarded properties on the island are located along this mile-long strip, and several other solid bets are a short walk away. Here are some of the best properties in the city that's so popular with tourists visiting San Juan that it's practically become a part of the capitol. It's a tight race between the Ritz and the El San Juan, but you must give El San Juan props for best hotel in Isla Verde for three reasons. First, there's the history: this place greeted the original Rat Pack in its heyday and has been of the capital's most elite properties since the golden age of Puerto Rican tourism. Second, it offers more than most hotels in terms of amenities, with one of the favorite casinos in San Juan, a favorite nightclub, an excellent shopping arcade, and more than one standout restaurant (like Koco). Third, it's got a prime location on the beach, in the thick of it all. It doesn't hurt that, after a recent renovation, the guest rooms have a modern, chic look with contemporary amenities. Simply put, the ample, beautifully appointed guest rooms, stellar service of the staff, retro-style casino (it's the first Ritz property to feature a casino), and fine dining (headlined by the superb BLT) at the Ritz are all outstanding. And that's before you get to the gorgeous pool adorned with stone lion fountains and facing the ocean. The Ritz, of course, occupies its own lovely and less hectic stretch of Isla Verde Beach. The Ritz is a place that marries the elegance of the brand with the relaxed tropical beauty of the Caribbean. And it's justifiably on many people's lists of top hotels in Puerto Rico. There aren't too many luxury boutique hotels in San Juan, and as far as we know, there is only one that qualifies in Isla Verde. The Water & Beach Club has so much going for it: great location in a removed cul de sac facing the beach (guests get their own beach chairs); stylish aqua-themed decor and style (check out the waterfalls in the elevators); sleek and cool-looking guest rooms; and a guest wish-list that strives to make your stay here as fulfilling as possible. Oh, and the rooftop lounge is among the favorite hangouts in the city. The Courtyard by Marriott lies on the far side of Isla Verde Beach; as such, it's one of the more removed hotels from the old city and metropolitan San Juan. But it makes up for it with beach access where many don't go, a decent local restaurant, an excellent kids program and general focus on family, and decent value for the money. Factoring in rooms equipped with work desk, DVD player, LCD TV, mini refrigerators, and in-room safe, and its 24 hour Casino del Sol, and you've got a hotel that gives you much of what the elite properties do at a discounted price. Formerly a Holiday Inn, this is moderately priced hotel trades higher prices for ​more distance from the beach. It's only about a block away from Isla Verde Beach, and an easy walk from many casinos and other neighborhood attractions. But you still get comfortable rooms, some solid restaurants (led by Coladas, a good Puerto Rican option), and a pleasant pool. With all the benefits of apartment living at hotel rates, the ESJ is a favorite option for those who want to live like a resident right on Isla Verde Beach. Your stay here includes a parking spot, Olympic pool, jacuzzi, children's playground, video game room, card room, ping pong and billiards, fitness center with sauna, and a full gym. And you don't have to pay resort fees to enjoy it.